(r-l) Dr. Lena Lavie, President Peretz Lavie, Jackie Safier, President of the Helen Diller Family Foundation, Jeff Richard, CEO of the American Technion Society. 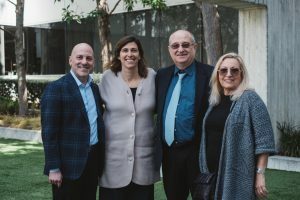 NEW YORK and SAN FRANCISCO (April 16, 2018) – The Technion-Israel Institute of Technology has announced a $50 million naming gift from the Helen Diller Family Foundation to support the university’s new state-of-the-art quantum center. The center will henceforth be named the Helen Diller Center for Quantum Science, Matter and Engineering. The gift, which is expendable to allow for its immediate use, will strengthen the Technion’s position as a world leader in quantum science and engineering by providing the means for new faculty recruitment, establishing new infrastructure, seed funding for research and development, and educating a new generation of engineers with a mastery of quantum mechanics. The Helen Diller Center for Quantum Science, Matter and Engineering – the first of its kind in Israel – is uniquely poised to advance the basic sciences while using the principles of quantum mechanics to impact various engineering fields, and to develop applications for a wide range of industries. Research conducted there will be focused on quantum computing and information processing, quantum communications, quantum sensing and detection, quantum simulations, simulators and quantum materials. The Center also will serve as a platform for collaboration between Technion scientists and engineers involved in quantum physics, nanotechnology, materials science, communications, and information theory, and will include researchers from the faculties of electrical engineering, physics, chemistry, materials science engineering, mechanical engineering and computer science. Quantum mechanics – a fundamental theory in physics that describes nature at the smallest scales of energy levels of atoms and subatomic particles – revolutionized science in the early part of the twentieth century. Now, Technion scientists are on the verge of being able to employ quantum in ways that promise to shape the future. Technologies born from quantum science will include: totally secure computing, communications and online transactions; superior sensing technology that can be used for medical treatments and diagnoses, and for monitoring chemical, biological and nuclear materials; the development of computers with computational powers far beyond those of standard computers; and new materials with unusual electrical, optical and magnetic properties that will lead to new and innovative devices and solutions. The Technion has a long history of major contributions to quantum science research. On May 15, 1935, Professor Nathan Rosen, the founder of the Technion Physics department, along with his mentor, Professor Albert Einstein, and their colleague, Boris Podolsky, published a historic paper on quantum fusion and the EPR Paradox (named after the three authors, listed alphabetically). In 1993, Technion Faculty of Physics Professor Asher Peres and colleagues published a groundbreaking paper on quantum teleportation, which has become a major milestone in quantum information and communication. The Technion’s broad and in-depth involvement in the field of quantum physics has continued ever since, with many Technion researchers being major figures on the world scene in all aspects of quantum sciences and engineering. Two top faculty members who will be part of the leadership of the Helen Diller Center for Quantum Science, Matter and Engineering are Professor Gadi Eisenstein, director of the Russell Berrie Nanotechnology Institute at the Technion, and Mordechai (Moti) Segev, the Robert J. Shillman Distinguished Professor of Physics at the Technion. Quantum Communication: With cybersecurity breaches disrupting governments, financial institutions and vast computer networks around the world, the advent of totally secure communications would be revolutionary. Because no cryptographically coded system that is not a quantum system can provide a similar degree of security, developing quantum aspects of computing, communications, communication security, sensing, and signal processing is vital. Quantum Sensing and Detection: Quantum sensors, which outperform traditional sensory equipment, will be used to monitor numerous physical conditions on land, in the air and at sea. Many security systems, including anti-missile defenses, night vision, and missile identification will be vastly improved with quantum sensors. Civil applications such as energy harvesting, medical treatment and diagnosis, environmental improvements via monitoring of dangerous chemical, biological, and nuclear materials will also have a large influence on society. Quantum Computing: Quantum computing is considered the “Holy Grail” of quantum technology. Quantum computers are fundamentally different from transistor-based classical computers that use binary (0/1) logic. Because quantum computers operate according to quantum mechanical principles, they make use of an endless number of 1 and zero combinations thereby enabling computational powers not possible with standard computers. Quantum Materials: Quantum technologies will require new and improved materials and are therefore crucial. The quantum materials often have unusual electrical, optical, and magnetic properties that can pave the way for a range of innovative quantum devices. New material fabrication techniques and sophisticated material characterization schemes will be developed together with deep theoretical studies of their properties. Quantum Simulators: Quantum systems can execute much more sophisticated simulations than existing computers. Therefore, they are expected to break new ground for simulations of fundamental processes in condensed matter physics and cold atoms, which will give rise to new technologies, biological systems, and optical systems such as the topological laser recently developed at the Technion Faculty of Physics. The Helen Diller Family Foundation is renown in the San Francisco Bay Area, North American, and global Jewish and general community. Thousands of Israeli and global Jewish teens have participated in the Diller Teen Fellows program drawing them closer to Israel and their Jewish identity. The national Diller Teen Tikkun Olam Awards recognize outstanding teens for volunteer service projects. The Foundation has funded historic gifts to UCSF for cancer, medical research, and a recently announced new hospital building in San Francisco. Museums have been beneficiaries of grants including the new Israel National Library under construction. The Foundation has created innovative playgrounds at major parks in San Francisco. The University of California, Berkeley, the University of California, Santa Cruz, have received funding among other educational institutions in Israel and the U.S. Jackie Safier, one of Sanford and Helen Diller’s three children serves as President of the family’s foundation and Chief Executive Officer of the family’s real estate business, Prometheus Real Estate Group, Inc.